The 40-acre site near Bug Light Park is where John Cacoulidis once proposed a massive hotel and convention center with a cable-car system across Portland Harbor. 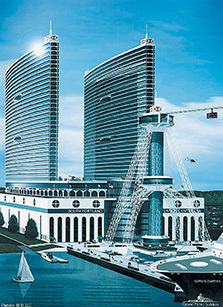 SOUTH PORTLAND — The Cacoulidis family has resumed efforts to redevelop about 40 acres of prime waterfront where 15 years ago patriarch John Cacoulidis proposed building a gasp-inducing $900 million hotel and convention center that included a cable-car system across Portland Harbor. The sprawling former shipbuilding site on Cushing’s Point has been cleared of brush and resurveyed in recent weeks, and four industrial buildings on the property are being renovated and offered for lease, said Tom Moulton, a partner at NAI The Dunham Group in Portland. 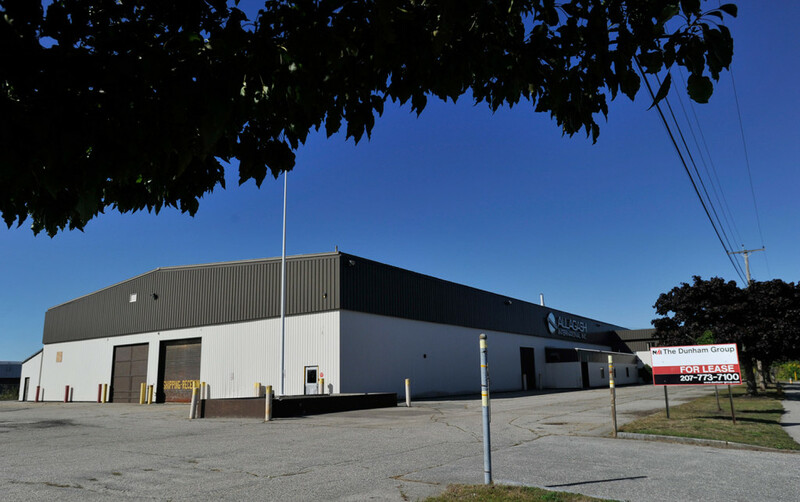 Moulton, who represents the family’s real estate interests, said a major national storage-and-distribution company is negotiating to lease one of the buildings, a 40,000-square-foot warehouse with office space at 1 Madison St., on the road to Bug Light Park. Moulton expects the lease to be signed within the next month. The landowners have no specific redevelopment plans at this time, Moulton said, but they envision a combination of commercial and residential uses such as a hotel, apartments or condominiums, medical offices, retail stores and community amenities. 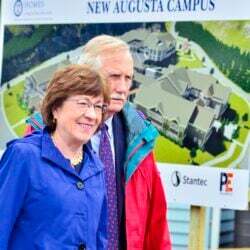 Moulton said John Cacoulidis, who lives on Hope Island in Casco Bay, still heads the family company, but his son, George Cacoulidis, a New York-based businessman, assumed operational control two years ago. The elder Cacoulidis bought the largest parcel, at 149 Front St., in 1999 for $1.4 million, according to city tax records. Part of a marine industrial complex where military ships were built during World War II, it was the centerpiece of a 2001 proposal for a convention center that called for two 41-story, elliptical-shaped hotel towers with a total of 2,600 rooms. The proposal also called for a 300-foot-tall cable-car system that would have whisked visitors across the harbor to Portland, as well as a marina for cruise ships and two hospitals, for general and plastic surgery. Public reaction ranged from disbelief to anger, with many saying the plan was too big and too urban. Cacoulidis scaled down the project in subsequent years, but it never got off the drawing board. Valued at $6 million for tax purposes, the land and buildings on Cushing’s Point are in the shipyard zoning district, which allows a variety of light industrial, commercial and marine uses, including hotels, restaurants, offices and shops. City Councilor Claude Morgan, who represents the neighborhood, has watched and welcomed the improvements being made on the property whenever he walked his dog there in recent weeks. Morgan noted, however, that the property comes with some challenges. It’s located off Broadway, a busy road at the end of a peninsula that includes residential neighborhoods, massive oil storage tanks and Southern Maine Community College. Morgan hopes the Cacoulidis family designs the project to be a part of the neighborhood, not separate from it, offering amenities such as a grocery store, shops, a community center and a police substation. 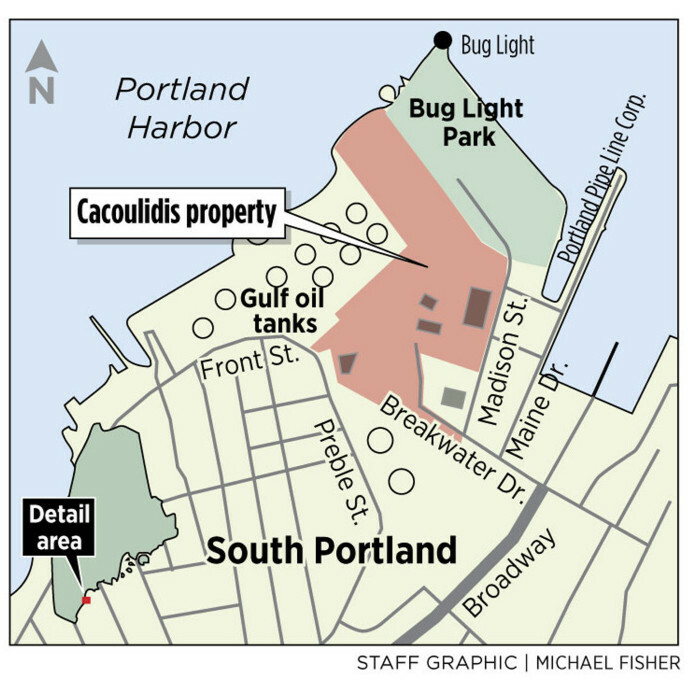 This story was corrected to say the Cacoulidis family property is on Cushing’s Point.